Frank Bruni was thinking and writing about community-minded priorities and great urban parks on his blog for the New York Times: "Several of them have the virtue of "wateriness" and are "sublimely situated pieces of real estate." Some are connected Emerald Necklaces. His list could/should include Memphis and our naturally spectacular riverfront! 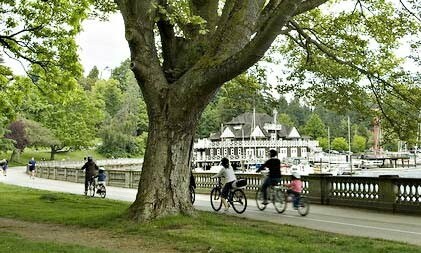 Photo of cyclists heading for Stanley Park by Bonny Makarewicz for The New York Times. Three of Bruni's favorites are: Margaret Island in Budapest, Stanley Park in Vancouver and Belle Isle in Detroit. Readers from all over the U. S., China, Europe, Central and South America added their favorites, places like the Charles River Esplanade in Boston, Golden Gate Park in San Francisco, Rock Creek Park in Washington, D.C. .... Reading the comments was like a wonderful tour guide itself. It was good to see that a reader from Michigan had added: " I share your affection of Belle Isle, which we both discovered while working at the Freep, but my favorite urban park will always be Overton Park in Memphis, a city whose charms are too rarely recognized." A good reminder of the beauty, parks, and pathways we have.